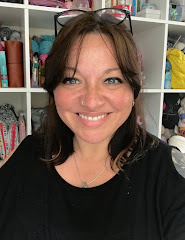 This post is not related to crafting, but as Crafts from the Cwtch has been the place I've shared about my life journey as well as my explorations in yarn craft, it feels like it belongs here. It was originally published on my other blog, but it's really a follow up to this post, THIS ONE, this one, this one, and this. Since the post went live, I've had the nagging feeling that it needed to be published here too and that posting it might even help with the particular 'ouch' I've written about below. If there's one thing I've learned this year, it's to follow my intuition, so here goes! Rebecca Campbell recently said the things that got us to this point may not be obvious, except in retrospect - when we look back on our path and can make out the invisible thread that joined the dots to our current destination. Each point along the route - each 'dot' - prepared us by educating and guiding us, providing a stepping stone to the next thing. All of which culminated in the current point, itself merely another step. On reflection, I can already connect some of my dots and I see they form a strange and deviated line which stretches waaaay back. For many years I heard whispers that I didn't quite understand. There were nudges. I felt drawn to certain things that deeply touched me and I'd open my mind for a while, only to have it close again amid the busy-ness of daily life. Yet I stashed books that I didn't read, I held onto certain articles, and made notes of random things in my journal. I wasn't paying conscious attention but I was unknowingly nudged along regardless, putting things aside until the time was right. Over the last year or so (since I've been developing my intuition / spiritual connection), I often found unread books on my Kindle, or handwritten notes with links to helpful websites scrawled in margins on exactly the topic I wanted to explore. In some cases, I'd already connected to people who could help me. My 'dotted line' has delivered me to this point at which I have a commitment to work on myself (through daily meditation, energy healing, developing my intuition, Tarot and so on) and to helping others. That's apparently something else I've been accidentally doing for some time. All of this has been showing up in my personal card-readings and in my choice of books for a while. It still is. After trimming The Enchanted Map deck I pulled three cards, which I posted on Instagram with the following interpretation. What are you being called to Heal? Yourself, others, the planet? The truth is that they are all aspects of the same thing, so you can't truly heal one in isolation. When you recognise this, it is clear that you must start with yourself. It's not something to take lightly, because it takes commitment and a conscious intent to heal your 'Ouches' and it likely begins with forgiveness and acceptance (of yourself and then others). 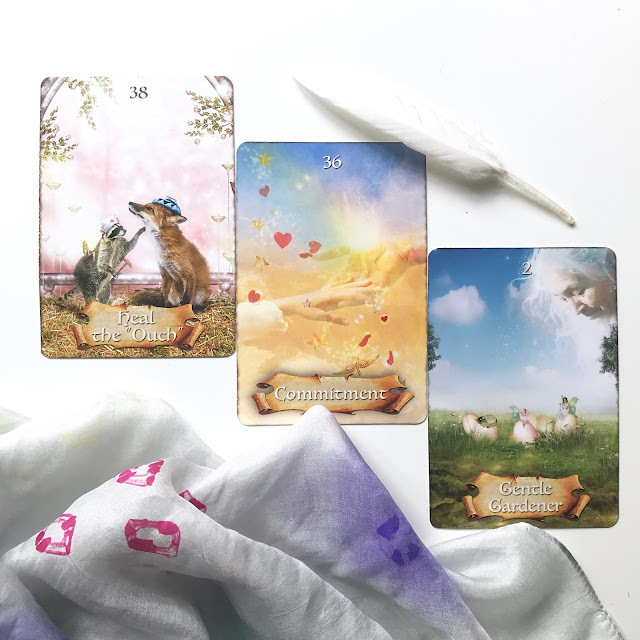 The Commitment card usually indicates a partnership, but here I see it as a reconciliation - a bringing together of all the parts of yourSelf that need healing - of accepting your 'inner child' and forgiving all that has happened, and gone before. Being in a loving partnership with yourself, then. The good news is Universal Energy (Source/Spirit) is your co-creator and it enables you to manifest your thoughts as your experience of reality. To heal, you need to use your thoughts *intentionally*. The clue is in the title - a Gentle Gardener nurtures the new life that's growing by removing weeds, pruning things that have grown unruly, and protecting the crops from threats such parasites and harsh weather. You can do the same with your thoughts - you'll be manifesting them anyway, whether they are for the greater good depends on your intentions. The numbers here are interesting - if you work backwards you can see that mindful co-creation (2) + commitment (36) = Healing (38). 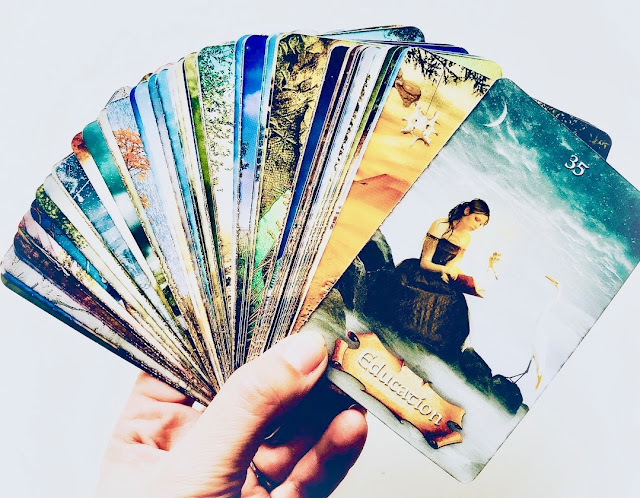 I often 'micro-blog' little three-card readings like this on Instagram, and I don't usually go back to them, but when I clicked through to see a comment someone had left, I re-read the words and could hardly recognise myself in them. Or rather, I recognised so much of my real self in them, it made me feel uncomfortable that I'd posted. There felt like a disconnect when I suddenly recognised this as an(other) Ouch I need to deal with. 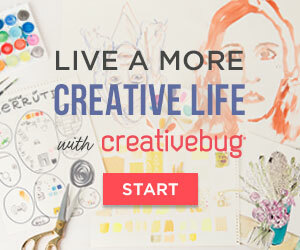 The feeling I had (of self-doubt) hit me so hard, other things started to make sense too. For example, I had an Energy Healing session this week and the practitioner had said "everything is there, and ready to flow, but something is blocking it, and the word I got was Confidence." In everyday life I'm sure I'd be described as a confident person, but in this area, I'm not. Yet. With perfect timing, Rebecca Campbell was running a Facebook Live Q&A session as I typed up this post. Someone asked a question and Rebecca's answer was about speaking your truth, putting your work out there without being attached to people's response to it. I know that, and have said it myself to others, but in this respect it still feels a bit 'ouchy'. I'm working on it. While I do, I'll leave you with this question - which Ouch(es) do YOU still need to heal? You can find the 'Heal Thy Self (Healthy Self) Spread' here, and the 'New Moon in Scorpio Spread' here, which might be helpful in figuring it out. If you don't use Oracle or Tarot cards, you might still use the questions as journal prompts, especially if you 'freewrite' - even though we are out of the new moon phase. You can learn how to freewrite here. If you'd like to read more posts on the topic of Oracle cards, Tarot, insightful exercises you can try at home, and reviews of products related to all things 'woo', take a look at The Curious Cardslinger Blog. You can also find a new page on Facebook and I'm on Instagram - I tend to post there most days so feel free to come and say hello. I know some you you already found me there and I love to hear from you.